El tráfico se modela mediante un proceso estocástico que representa la demanda que los usuarios de una red de comunicaciones imponen sobre los recursos de la red. Originalmente se consideró que los tiempos entre llegadas de las demandas de los usuarios eran independientes entre sí, así como la cantidad misma de la demanda (tiempos entre llamadas y duración de las llamadas, tiempos entre llegada de paquetes y longitud de los paquetes, tiempos entre solicitud de conexiones y duración de las sesiones, etc.). Posteriormente se vio la necesidad de incluir el efecto de la correlación existente entre estas variables, para lo cual se desarrollaron modelos más elaborados en los que la correlación decaía exponencialmente con el tiempo. Sin embargo, recientemente se ha evidenciado que, en las redes modernas de comunicaciones, la correlación entre estas variables no decae tan rápidamente y puede persistir a través de muchas escalas de tiempo. Este fenómeno, que afecta significativamente el desempeño de las redes de comunicaciones, se puede representar adecuadamente mediante modelos de tráfico fractal o autosimilar. En este artículo se presentan los conceptos más básicos involucrados en el estudio de estos modelos, con el fin de facilitar al lector su introducción a la literatura especializada sobre el tema. Traffic is modeled as an stochastic process representing the demand that users impose on the resources of a communication network. Originally,both the demand interarrival times and the demand amounts were considered as sequences of independent variables (call durations, packet lengths,file sizes, etc.). Later on, it became apparent that the correlation among these variables were so important that new models with exponentially decaying, correlations were developed. However, recent evidence has shown that the correlation among these variables can decay much slower and persists through several time scales. This phenomenon, that impacts the network performance significatively, can be represented via fractal or self-similar models. In this paper we present the most basic concepts involved in the study of these models, hoping to help the reader to be better prepared for reading the especialized literature on the subject. P. Abry and D. Veitch. Wavelet Analysis of Long-Range-Dependent Traffic. IEEE Trans. Information Theory, 44(1):2-15, 1998. A. Adas and A. Mukherjee. On resource management and QoS guarantees for long-range dependent traffic. GIT-CC-94/60 1994. M. Alzate. Obtención de Bases Wavelets Ortonormales Mediante el Diseño de Bancos de Filtros de Reconstrucción Perfecta. IV Simposio de Procesamiento de Señales, Universidad de los Andes, 1995. M. Alzate. Conmutación de Paquetes de Voz. X Congreso Nacional y I Andino de Telecomunicaciones, 1995. M. Alzate. Modelos de Tráfico en Redes de Comunicaciones. 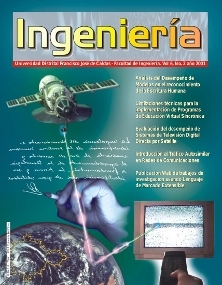 Reporte de Investigación de la Maestría en Teleinformática de la Universidad Distrital, marzo de 1995. M. Alzate. Tráfico de Voz en ATM Sometido a Control de Admisión por Leaky Bucket. Revista INGENIERIA, enero-marzo, 1996. M. Alzate. Generation of Simulated Fractal and Multifractal Traffic. IX Congreso Nacional de Estudiantes de Ingeniería de Sistemas, Bogotá, 2000. M. Alzate. Active Networking and Congestion Control under SelfSimilar Traffic. Institute for System Research, Technical Report, to appear in 2002. M. Arlitt and C. Williamson. Web Server Workload Characterization: The search for Invariants. IEEE/ACM Trans. Networking, 5(5):631-645, 1997. J. Beran. Statistics for Long Memory Processes. Chapman and Hall, New York, 1994. J. Beran, R. Sherman, M. Taqqu and W. Willinger. Long-Range Dependence in VBR video traffic. IEEE. Trans. Commun. 43:1566-1579, 1995. O. Boxma and J. Cohen. The M/G/1 Queue with Heavy-tailed Service Time Distribution. IEEE J. Selected Areas in Commun. 16:749-763, 1998. M. Crovella, M. Taqqu and A. Betsavros. Heavy-Tailed Probability Distributions in the WWW, In "A practical guide to Heavy Tails", Adler, Feldman and Taqqu, editors. Birkhauser, 1998. M. Crovella and A. Bestavros. Self-similarity in WWW traffic. IEEE/ACM Trans. Networking, 5:835-846, 1997. A. Erramili, O. Narayan and W. Willinger. Experimental queueing analysis with LRD packet traffic. IEEE/ACM Trans. Networking, 4:209-223, 1996. A. Feldman, A. Gilbert, P. Huang and W. Willinger. Dynamics of IP Traffic: A Study of the Role of Variability and the Impact of Control. Proc. ACM SIGCOM'99, 1999. P. Flandrin. Wavelet Analysis and Synthesis of Fractional Brownian Motion. IEEE Trans. Inf. Theory, 38:910-917, 1992. V. Frost and B. Melamed. Traffic Modeling for Telecommunications Networks. IEEE Commun. Mag. 32(3):7081, 1994. A. Gilbert, W. Willinger and A. Feldman. Scaling analysis of conservative cascades with application to network traffic. IEEE Trans. Information Theory, 45(3):971-991, 1999. T. Gyires. Using Active Networking for Congestion Control in High-Speed Networks with Self-Similar Traffic. 0-7803-6583-6 © 2000 IEEE. T. Hagiwara, H. Doi, H. Tode and H. Ikeda. High-Speed Calculation Method of the Hurst Parameter Based on Real Data. LCN 2000. D. Heyman and T. Lakshman. What are the Implications of LRD for VBR Traffic Engineering? IEEE/ACM Trans. Networking, 4(3):301, 1996. Internet Traffic Archive. BC_pAug89, http://www.acm.org/ sigcomm/ITA/index.html. W. Leland, M. Taqqu, W. Willinger and D. Wilson. On the selfsimilar nature of Ethernet Traffic. IEEE/ACM Trans. Networking, 2:1-15, 1994. S. Ma and C. Ji. Modeling Heterogeneous Network Traffic in Wavelet Domain. IEEE/ACM Trans. Networking, 9(5):634-649, 2001. B. Mandelbrot and J. VanNess. Fractional Brownian Motions, Fractional Noises and Applications. SIAM Rev., 10:422-437, 1968. I. Norros. On the Use of Fractional Brownian Motion in the Theory of Connectionless Networks. IEEE J. Selected Areas in Commun. 13(6):953-962, 1995. K. Park and W. Willinger. Self-Similar Network Traffic and Performance Evaluation. John Wiley and Sons, New York, 2000. M. Parulekar and A. Makowski. M/G/ Input Processes. Proc. IEEE Infocom'97, 1997. V. Paxson and S. Floyd. Wide-Area Traffic: The Failure of Poisson Modeling. IEEE/ACM Trans. Networking, 3:226-244, 1995. R. Riedi, et. al. A Multifractal Wavelet Model with Application to Network Traffic. IEEE Trans. Inf. Theory, 45(3):992-1018, 1999. M. Schwartz. Telecommunication Networks: Protocols, Modeling and Analysis. Prentice Hall, N.Y. 1989. M. Taqqu, W. Willinger and V. Teverovsky. Estimators for Long-Range Dependence: An Empirical Study. Fractals 3(4):785-798, 1995. A. Tewfik and M. Kim. Correlation structure of the discrete wavelet coefficients of fractional brownian motion. IEEE Trans. Info. Theory, 38:904-909, 1992. B. Tsybakov and N. Georganas. Self-Similar Processes in Communications Networks. IEEE Trans. Inf. Theory, 44(5):17131725, 1998. D. Veitch and P. Abry. A Wavelet-Based Joint Estimator of the Parameters of LRD. IEEE Trans. Inf. Theory, 45(3):878-897, 1999. W. Willinger, M. Taqqu, R. Sherman and D. Wilson. Self-Similarity Through High Variability: Statistical Analysis of Ethernet LAN Traffic at the Source Level. IEEE/ACM Trans. Networking, 5(1):71-86, 1997.